The largest sports media property in Asian history, ONE Championship™ (ONE), has announced nine bouts for ONE: GLOBAL RIVALS which takes place 15 April at the Mall of Asia Arena in Manila. Fans in the Philippines will witness all the action live as ONE Welterweight World Champion Ben “Funky” Askren returns to defend his title against hard-charging Russian opponent Nikolay Aleksakhin. Tickets for ONE: GLOBAL RIVALS are available at www.smtickets.com. Former NCAA Division I All-American and Olympian Ben Askren is a collegiate wrestling legend and one of the finest mixed martial artists in the world today. In just a few fights in ONE, Askren was able to seize the ONE Welterweight World Championship with a resounding technical knockout victory over Nobutatsu Suzuki. The highly-skilled Askren is widely considered to be the absolute best in his division and one of the best fighters in the world pound for pound. His next challenge is a tough one, as he goes head-to-head with Russia’s Nikolay Aleksakhin. 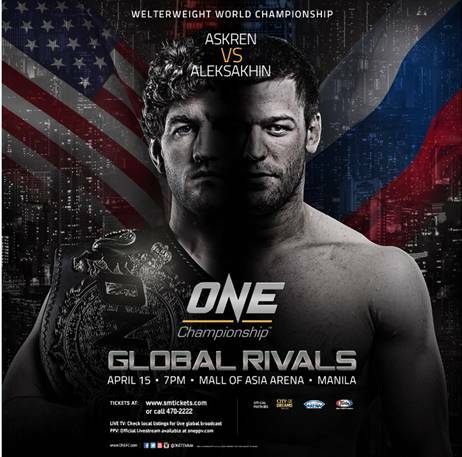 A veteran welterweight from Russia, Nikolay Aleksakhin will make his highly-anticipated return to the ONE Championship cage in Manila this April. Aleksakhin was impressive in his debut for the promotion when he submitted Burenzorig Batmunkh with a rear naked choke within three rounds. Now, Aleksakhin gets the call to face ONE Welterweight World Champion Ben Askren and will look to surprise the crowd with intense action. Team Lakay bantamweight Geje “Gravity” Eustaquio is one of the most proficient Wushu practitioners in the Philippines. Eustaquio’s accurate striking and cool composure has led him to a few big wins over the course of his career in ONE Championship. In his last bout, Eustaquio scored a scintillating one-punch knockout over Malaysian prospect Saiful Merican. He now looks to replicate his success against Gianni Subba. Gianni Subba is one of the most promising prospects at ONE. At just 23-years old, Subba is already a seasoned athlete with a stellar 7-1 clip in his young career. He has won his last four bouts and in his last outing, he defeated the highly-regarded Anatpong Bunrad of Thailand. Subba now faces his toughest challenge yet in a bantamweight bout with Geje Eustaquio. Lowen Tynanes of Ewa Beach, Hawaii, is a 25-year old unbeaten lightweight competitor and one of the most talented fighters in his division. Tynanes uses his aggressive striking approach and no-frills wrestling techniques to subdue his opponents inside the cage. He has defeated some of the biggest names in Asia, and now he is scheduled to take on Japanese veteran Koji Ando. Koji “The Commander” Ando is one of Japan’s fiercest competitors, having been a mixed martial artist since 2008. The Japanese fighter is never in a boring fight and always remains a threat no matter who the opponent. With an array of diverse striking skills coupled with solid submission grappling credentials, Ando is ready to claim victory once again inside the ONE Cage. This time he battles Lowen Tynanes of the United States. Featherweight standout Eric “The Natural” Kelly of Baguio City is highly-regarded as perhaps the best homegrown mixed martial artist to come out of the Philippines. The Filipino matches his solid striking techniques with a high-level grappling game, which has resulted in 9 submissions out of 12 victories. Kelly is on the trail for a shot at the featherweight title, but he’ll have to go through Timofey Nastyukhin to get it. Russia’s Timofey Nastyukhin has notched a series of ferocious finishes since joining ONE Championship, including technical knockouts of top fighters Eduard Folayang and Yusuke Kawanago. He fell short of victory in his last bout against Herbert Burns and Nastyukhin now returns to action against one of the biggest names in the Philippines. He’ll take on grappling specialist Eric Kelly next. 24-year-old Filipino-Australian bantamweight standout Reece “Lightning” McLaren scored the biggest win of his young career in his last bout, a submission victory over Mark “Mugen” Striegl. McLaren showcased great striking skills paired with a technical ground game which resulted in a spectacular come-from-behind finish. McLaren now gets the chance to connect with his Filipino roots as he takes on Muin Gafurov in Manila. Muin “Tajik” Gafurov of Dushanbe, Tajikistan proved in his ONE Championship debut that he is a relentless, aggressive fighter with solid all-round mixed martial arts skills. He is unbeaten at 10 wins and no losses and is a force to be reckoned with at bantamweight. In his last bout, Gafurov defeated Finnish MMA sensation Toni “Dynamite” Tauru via technical knockout and now he looks to do the same against Reece McLaren. Team Lakay’s Honorio “The Rock” Banario has long been one of the Philippines’ most respected mixed martial arts veterans. The former ONE Featherweight World Champion, Banario is back and ready to show fans exactly what he’s been working on in the past few months since his last fight. An expert in Wushu, Banario will showcase his lightning quick strikes against fellow Filipino fighter, Vaughn Donayre. Lightweight standout Vaughn “The Spawn” Donayre is a Filipino mixed martial artist based in Dubai. The Cebu native quit his mechanical engineering job to become a fighter. Donayre is highly regarded as an exciting mixed martial artist constantly in pursuit of a finish and in his next bout, he takes on Filipino MMA veteran Honorio Banario. Team Lakay’s April Osenio made her much awaited ONE Championship debut against Singapore’s Kirstie Gannaway last year. Although Osenio fell short of victory, the 21-year-old female atomweight learned a lot in her first time inside the ONE Cage. Osenio now looks for her first victory, but it will have to come against fellow Filipino Natalie Gonzales Hills. Filipino-Australian Natalie Gonzales Hills is a worthy female atomweight contender with a solid record. Her two wins inside the cage have both come by submission, with her ground game proving to be an asset. Aside from grappling, Hills also boasts high-level striking technique to round out her skillset. Against April Osenio, Hills will have to dig deep to emerge victorious. Young prospect Bernard “Hitman” Soriano of the Philippines will take on Indonesian Sunoto in a three round bantamweight contest, while Team Lakay flyweight Danny Kingad makes his ONE Championship debut against Muhamad Haidar of Malaysia to kick off what should be an action-packed evening of world-class mixed martial arts. ONE Championship is the largest sports media property in Asian history. Headquartered in Singapore, the world’s most exciting mixed martial arts organization hosts the best Asian mixed martial artists and world champions, all signed to exclusive contracts, on the largest media broadcast in Asia. ONE Championship™ has partnered with FOX and STAR Sports for an unprecedented 10-year cable television deal with a coverage that spans 70+ countries across the world.